Can You Naturally Increase HGH Levels? Human growth hormone, or HGH, is one of the most important hormones for sustained growth into adulthood. In children as well as adults, it also helps stimulate protein synthesis and fat metabolism. As adults age and HGH levels naturally decline, it can be harder to maintain muscle tissue and keep excess pounds at bay, partly because HGH -- which has been referred to as a so-called “fountain of youth” -- promotes lean tissue and helps mobilize fat for energy. Getting the recommended seven to nine hours of sleep – or however much you need to feel rested and replenished – is essential for promoting optimal HGH levels. Your pituitary gland, a pea-sized structure at the base of your brain, makes HGH and secretes it in six to 12 bursts per 24-hour cycle. Although its production is influenced by a variety of factors, sleep is one of the primary requirements for HGH secretion. 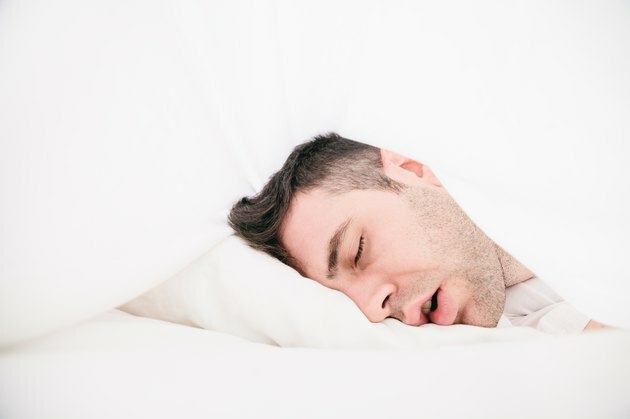 Under normal circumstances, your body’s HGH levels are higher during sleep than at any other time -- according to the website Precision Nutrition, HGH levels typically peak between 11 p.m. and 2 a.m. Getting less sleep than your body needs to recover – or having interrupted sleep – can interfere with your body’s ability to release HGH. Regular exercise is another way to naturally increase HGH secretion, but not all exercise is equally affecting. The best way to boost your HGH levels is through intense exercise, whether it’s in the form of sprints, intervals or resistance training. Regular, intense exercise promotes higher levels of HGH after each session, as well as over a 24-hour period, according to the University of Michigan Medical School. Brief recovery intervals in the midst of an intense workout can also boost HGH levels -- according to Precision Nutrition, resting for 60 seconds or less during intense interval training helps stimulate HGH secretion. While load, frequency and recovery all influence HGH secretion, duration of exercise does not. Endurance exercise -- the type that can be easily sustained for long stretches and doesn’t take you beyond your lactic threshold, or the point at which you “feel the burn” -- initially boosts HGH secretion, but the effect diminishes as your body adapts to the workout over time, with its release dropping after about three weeks of training. Nutrition can also influence HGH secretion. Indeed, a high-carbohydrate diet may reduce HGH secretion. According to a study published by the Journal of Clinical Endocrinology and Metabolism in 1976, men who got 80 percent of their calories from carbohydrates saw a significant drop in their HGH levels. By comparison, men who ate a diet that was 40 percent carbohydrates, 40 percent fat and 20 percent protein were able to sustain normal HGH levels. A 2012 study published in Growth Hormone and IGF Research found that specific nutrients -- including vitamin C and dietary fiber -- promote the release of HGH. Foods that are high in vitamin C include citrus fruits, strawberries, raspberries, kiwi, mango, broccoli, bell peppers, leafy green vegetables and tomatoes. All plant-based foods provide dietary fiber, including fruit, vegetables, whole grains, nuts and seeds. Dried beans, peas and lentils are especially rich in fiber. Arginine, an amino acid, also stimulates the release of HGH. Although you can get plenty of arginine in your diet by consuming enough protein, certain foods -- including many nuts, seeds and beans -- are particularly good sources. Because excess body weight can suppress HGH secretion, losing weight and maintaining a lean body can naturally boost your HGH levels. This may be partly because HGH secretion is directly regulated by ghrelin, a hormone that’s mainly secreted in your stomach. In addition to playing a major role in promoting HGH secretion, ghrelin is also essential to appetite, eating behavior and energy balance. Obese people typically have lower levels of ghrelin -- and consequently HGH -- in their blood than leaner individuals, according to Colorado State University. Avoiding alcohol can also help you maintain normal HGH levels, because alcohol suppresses its release during sleep. According to a study published in the Journal of Clinical Endocrinology and Metabolism in 1980, adults who consumed just one alcoholic drink saw their HGH levels drop by as much as 75 percent as they slept.